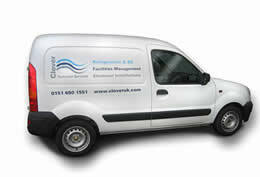 Clover Technical Services has become one of the fastest growing Facilities Management companies in the North of England. Our team of experts have over 75 years of top-flight experience in Refrigeration, Air conditioning and Electrical and Mechanical services, providing installations, service and spares. Our clients have the confidence to trust Clover to take care of their buildings and plant while they get on with running their business. That trust has been built on three main foundations – Service, Expertise and Competitiveness. We are currently accredited with ISO 9001: 2000 for quality and ISO 9001: 2004 for environmental and these policies are maintained at all levels within the company. All of our technicians are trade qualified and have successfully completed an approved refrigerant handling competence assessment and are registered in the ACRIB Refrigerant Handling Register. Our technicians are trained in the current Health & Safety Legislation and hold valid SCATS (Safety Competency Assessed Training Scheme) cards.